In-Sink provides 24 hour, seven day a week, emergency plumbing services. When you have a plumbing disaster at odd hours, and you need help immediately, we are an emergency plumbing company that can be there for you at all hours for those in need. Our licensed master plumber and mechanical HVAC contractor is capable of making repairs at any time of the day on any day of the week. Whether it’s at two in the morning and ten below, or if you have to present a house to a potential buyer within the next twenty-four hours, our company can tackle any plumbing, heating, cooling, or ventilation problem quickly and efficiently. Although these services require an extra fee, we are sure you will feel the assistance we provide is worth it. 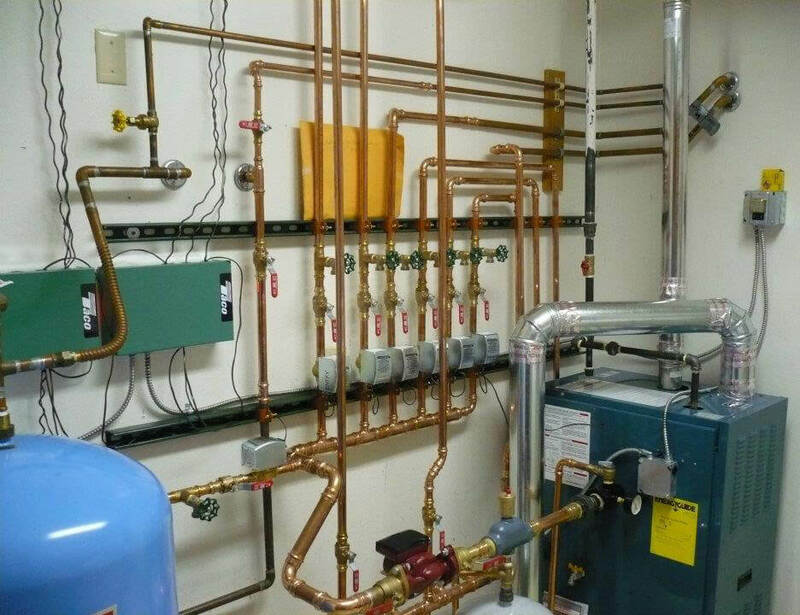 The plumbing services we offer also include dealing with the heating systems inside a boiler room. Because these systems are vital for keeping your building or complex warm and healthy during the winter season, these systems need to be in tip-top shape. Our plumbing technicians are trained and fully capable of ensuring your boiler system works fine. These systems are particularly vulnerable to damage during the winter season when water freezes and throws the whole system into chaos, but our plumbers are more than proficient in ironing out any problems these heating systems might incur. We also fix and install radiant heat boilers. Any radiant heat boiler device can be repaired by our team of professional plumbers, and just like all of our other services, these services can be accessed 24 hours a day on any day. These types boilers are an incredibly efficient heating technology, and proper maintenance will ensure they perform optimally and continue to save you money. However, they are every bit as vulnerable to breakdown as other plumbing systems and getting them repaired quickly and at an affordable cost is important to any homeowner or building manager. Properly functioning water heaters are essential, not just in the winter, but year around. Ensuring that you have hot water to wash yourself and other objects such as laundry and dishes is fundamental to making a building habitable, and our technicians can repair any style of water heater unless it is so badly damaged it requires replacement. Whether your hot water heater needs simple maintenance, refurbishing, or full on replacement, our plumbers are more than capable of tackling that job at a reasonable price. We also offer options to upgrade your traditional water heating system to an on-demand hot water system. In a less dire vein, In-Sink also does full on bathroom remodeling. We can install, replace, or upgrade any plumbing fixture found in a bathroom, including the toilets, showers, bath faucets, and of course the sinks that every bathroom needs to be useful to its owner. With a bit of time, we can totally transform any bathroom. These transformations can be a matter of both practicality and personal style and are best undertaken with a clear plan in mind. Some of these remodelings can be very simple, while, others require a major overhaul. In extreme cases, the renovation will take some time, but we are very efficient and waste no time. For people with water well pumps and pressure tanks, these devices can be lifesavers under the right conditions, but absolute nightmares when they stop working properly. Our plumbers can get your system up and running again as readily as any other plumbing system and can do it right the first time at an affordable rate. No matter what has gone wrong with your water well or pressure tank, we can fix it quickly enough and get the water flowing back to your home with no difficulty at all. Though we can’t repair a genuinely dry well, we can mend or replace any other element of a damaged water well pump. Our In-Sink plumbing professional can correct water softener and filtration problems. Because water softeners can be so critical in areas where hard water is a problem, we also install and offer scheduled maintenance to keep ahead of any system problems. If your water softener breaks down, our team of expert plumbers can get it back to full working order again quickly. We can also install water filters and filtration systems making your water safe to drink and wash with again. For us here in The Flathead Valley, the temperature is not always balmy at all hours so installing an on demand hot water or hot water recirculation system can make our everyday lives a little more pleasant. Because these systems create more hot water without the added cost of heating water all day long, many people are finding these systems to be a good solid investment, as well as better for the environment by simply reducing energy consumption. Pex water piping is a new fangled form of plumbing piping that not every plumber is ready to deal with. However, at In-Sink we are more than qualified in handling this exceptional way of piping and are highly skilled at installing and repairing pex piping. We are proficient in new construction building and planning no matter if it is a commercial or residential property. Because, very few buildings are complete without a water hook up, our company specializes in connecting new constructions to the local water network. While each job is, of course, unique, our company can handle any new construction complication. We can manage anything you can throw at us. We can hook you up with laundry hook ups and hose bibs, and ensure that you have an ample supply of water flowing to your washing machine and efficiently draining away. We can install or move your washer hookups or remodel your laundry room. We could also do this for the local laundromat owners as well. When a water main gets damaged or destroyed, your building can be crippled for weeks. Getting these systems working again can be imperative to making your home or building livable again. Charlie, the In-Sink master plumber, is fully qualified to repair and install these systems and get them delivering water into your home or building with minimal hassles. Since water mains tend to handle high volumes of water, damage to these systems can create severe flooding. That can lead to all kinds of property damage, as well as possibly giving mold spores the chance to blossom into genuinely toxic molds that can threaten the health of everything in the building. Fixing leaking water pipes is a major part of a plumbers business, so you can rest assured that we can handle your leaky pipes. No matter how big or small the leak is or what kind of piping was used, our plumbing professionals can not only locate the leaks using advanced digital technologies but can also efficiently and effectively repair the leaks in the shortest time possible. We also have a system in place to help decrease the potential for mold growth and property damage. Here in Montana regular service and preventative maintenance of your HVAC furnace can be essential for getting you through the long winter months. Internal climate control systems are indispensable for your health and comfort in the late autumn, winter, and early spring. As human beings we need to maintain a minimum body temperature, these systems are literally helping keep the people in your home or building alive throughout the cold season. When these systems break down, getting them fixed quickly is essential for the health and safety of a building’s occupants. During the hot season, however, mini split systems, air conditioning systems, and other means of internal climate control can also be indispensable for keeping people from overheating and suffering from the summer heat. If these cooling systems break down, it can be hard to stay comfortable, and individuals with medical predispositions could experience health problems from the intense heat and may actually be in some danger from the extreme summer heat itself. When you hire In-Sink, you can take comfort in knowing that all of our work comes with a lifetime labor guarantee. We stand behind everything we do and take pride in every job we perform. We are dedicated to excellence and making sure things are done right the first time, and we always go out of our way to be careful, level-headed, and thorough on all our services, whether it’s a whole new construction project or just fixing a leaky faucet. Tap Here To Call Us Right Now! You can rest easy knowing that your needs are in the capable hands of a dedicated professional with over 35 years of experience. We Use Only The Highest Quality Parts!